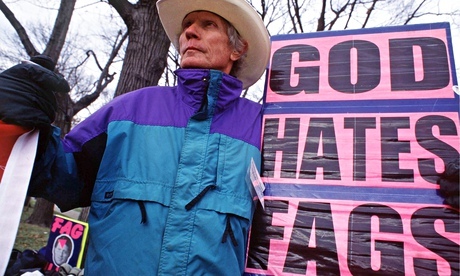 T he most homophobic man on earth, Rev Fred Phelps, 84, is dead. My first encounter with the Topeka Tornado, known for picketing LGBT events with “God Hates Fags” signs, was in 1993. We were both guests on a Florida talk radio show. The moment he realized the host was pro-gay, he went on a rant, calling the interviewer a “fag host” on a “fag station.” And, of course, I was a liberal “fag” activist. After he gratuitously insulted us, he simply said, “I’m done,” and hung up the telephone in the middle of the interview. While many are gleeful that he has passed, I’m going to miss the old coot. In an age of relentless spin, this loathsome creature was truthful in his thoughts about what he regarded as sin. In my two decades of LGBT advocacy, he’s the only honest person I’ve ever encountered on the Religious Right. He says what many of them truly believe but are too careful and timid to say publicly. He was raw hatred in its purest, most vile form, and didn’t lie through his teeth, which often seems to be an evangelical pastime, when it comes to LGBT issues. 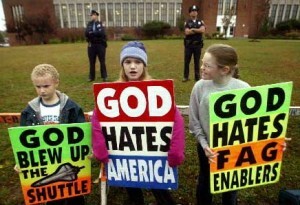 If the answer to this question was “yes,” many of these individuals found themselves doing what they had once advised gays to do: “Change their lifestyle.” No one in their right mind wanted to be like Fred Phelps, a rabid madman consumed by an almost inexplicable obsession with the object of his revulsion. 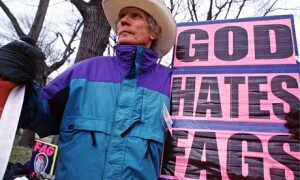 Fred Phelps never angered me because I considered him insane. He was a perverse cartoon character who was born without a filter. He was Exhibit A that “crazy has no brakes” and he cheerfully careened headfirst into social walls, unbothered by the wreckage – whether to his reputation or his own abused family. The Supreme Court upheld his right to picket military funerals in 2011 on free speech grounds. As a result, Congress and a few states passed laws designed to keep his clan at a healthy distance from memorial services. I have zero admiration for this hater extraordinaire. But he is refreshing compared to his disingenuous counterparts who are equally evil, but play this transparently absurd game of “love the sinner, hate the sin,” which few people are duped into believing. Yet, these con artists unctuously recite this fib with a saccharine grin, as if they repeat it enough it will magically be true. At least Phelps cut to the chase instead of lying to my face. His blistering honesty earned him the eternal enmity of the organized Religious Right. Their operatives despised him with a special passion. These sophisticated power brokers would spend millions of dollars to concoct elaborate schemes to make them appear tolerant, such as the infamous 1998 “Truth in Love” campaign, which was a series of newspaper and TV advertisements that claimed to cure LGBT people. Then Uncle Fred would slither out of the woodwork to foil their careful plans with his heinous signs and blistering “fire and brimstone” rhetoric. In doing so, he would steal their thunder, and their headlines, which would drive them to distraction. On more than one occasion, anti-gay activists would privately tell me they thought Phelps was a gay plant strategically deployed to make them look bad. 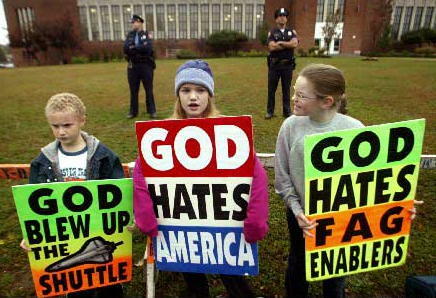 No one has done more to turn the next generation away from anti-LGBT bias than Fred Phelps. In this sense, he was a monumental failure who achieved the polar opposite of what he set out to accomplish. His main legacy is ripping off the Religious Right’s mask and exposing them as fraudulent haters and hypocrites. In a world full of plastic people, at least Phelps was authentic, even if it was authentic evil.